It’s with genuine surprise and a little embarrassment that I have to admit I enjoyed Marvel Team-Up, Vol. 1: The Golden Child. It begins with a discovery, by both Spider-Man and the X-men, of a teenage boy with dangerous powers. The conflict expands when an evil alternate reality Iron Man captures the boy in the hopes that he can use the teenager’s power to send him back to his own reality. In the meantime, a skrull villain named Titannus has something to do with the conflict, though it isn’t made clear exactly how. Unlike the original Marvel Team-Up, which usually featured one regular character (Spider-Man, 99% of the time) and one guest character, the cast of Kirkman’s MTU is always rotating (though Spider-Man still seems to find a way back every few issues), and the storyline remains constant throughout the line-up changes. Heroes appearing in the The Golden Child include the FF, Dr. Strange, the Hulk, Sunfire, and Captain America. Kirkman’s scripting isn’t particularly impressive. The cute jokes characters like Spider-Man and Wolverine knock back and forth seem terribly forced (like the big revelation at the end of the trade that other heroes find Spider-Man annoying, about insightful as pointing out that other heroes find the Hulk to be green) and certain characters are tacked on for little or no reason (Black Widow and X-23 most notably). As was sometimes the case with the old series, you really can’t trust the cover. 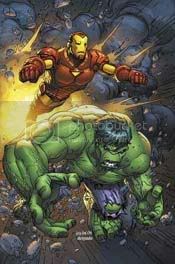 For example, the issue reprinted in the fourth chapter was originally advertised as a team-up between Iron Man and the Hulk. In fact, the Hulk only shows up for a few pages (both Doctor Strange and the FF are featured more prominently than the green golaith), he trades blows with Iron Man rather than “teaming up,” and the Iron Man appearing is not the one on the front cover, but the aforementioned alternate reality version. I can’t blame anyone for wanting to chain me to the back of a van and drive through a construction site after reading the following, but what I like about MTU is that, in different ways, it seems like Marvel’s (vastly inferior) answer to books like Seven Soldiers and even Astro City. Like Astro City, MTU gives it readers a vibrant world thick with superheroes which, you know, is fitting since the Marvel Universe is a vibrant world thick with superheroes. Characters like Moon Knight appear briefly for one or two panels only to silently melt into the shadows. One chapter opens with a splash of Nova (the Larsen one, not the Herald) screeching over the streets and calling out his name, even though he has nothing to do with the rest of the story. The book’s appeal, I think, has more to do with post-Jemas fallout than anything else. After a few years of the various Marvel creative teams all but denying the fact that Daredevil, the Hulk, the Avengers, the X-men, etc. all existed in the same world, readers are understandably relieved to find a Marvel book that not only acknowledges the fact that - regardless of their different home titles - these heroes are essentially characters in the same story, but revels in it. As far as how it’s like Seven Soldiers, well, the thing is that as much as I have almost nothing but bile to spew when it comes to conversations about crossover events like Infinite Crisis or House of M, the fact is that I dig the concept behind the company-wide event. At least, I dig the concept the companies use to sell the things, not the actual concept ($$$). The idea of an adventure that takes heroes usually confined to their home titles and brings them together for a larger story is cool. It’s epic. It’s ambitious. It has promise. The reason I refuse to buy the big, stupid things is that the promise is never kept. It can’t be kept precisely because of the confines of a cooperative universe. There’s too many chefs in the kitchen and as a result the overall feel of the story suffers, as does the narrative since in almost every case the different creative teams fail to get their stories straight. The hype that each event will "change everything!!!!!" is either absolutely wrong, or completely correct except the changes in question don’t save the overall craptaculation of the event. When I first heard of it, I felt one of the ideas behind Seven Soldiers was to give readers the ideal crossover event. With only one writer at the helm, it’s less likely to suffer from "too many chefs," and since it never makes the promise of "changing everything!!!!!!!" you just get an epic adventure with multiple protagonists. 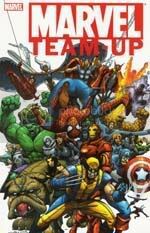 Kirkman’s Marvel Team-Up seems to be more of the same, though it’s doubtful that its quality matches Morrison’s (I honestly don’t know, still waiting for the trade, but it’s Morrison). In this sense, The Golden Child shows promise, and I’ll freely admit I’m as much of a victim of the post-Jemas fall-out as the aforementioned Marvel readers. My enjoyment of it has nothing to do with appreciating it as high art. This is pure nostalgia for the cooperative universe I fell in love with as a child. Scott Kolins’s art doesn’t hurt either. It’s the most impressive element of the comic, and it’s likely if/when he leaves the title, I’ll stop buying the trades.